1. Preheat the oven to 200ºC, gas mark 6. Heat half the oil in a small frying pan and cook the pancetta for 4-5 minutes until crisp. Add the rosemary and garlic, cook for 30 seconds, then remove from the heat. 2. Lightly brush the sourdough with the remaining oil. 3. Peel, core and slice the pears and arrange on the bread with the sliced Brie. Spoon the pancetta and rosemary oil over each. Transfer to a baking sheet and bake for 10-15minutes until the bread is crunchy and the cheese has melted. 4. Divide between 6 plates and scatter a little rocket over each to serve. 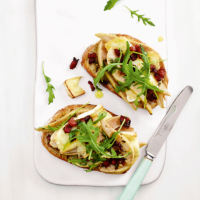 For a vegetarian version of this, skip steps 1 and 2, and instead spread the bread with Waitrose Apple & Walnut Chutney before topping with the Brie and pear slices. This recipe was first published in Wed Apr 20 10:44:09 BST 2016.